It's the time of the year to celebrate Mother's Day. Mother's day falls on the 1st Sunday of May each year, that is 8th May in 2011, if anyone still wondering when is the exact date!! 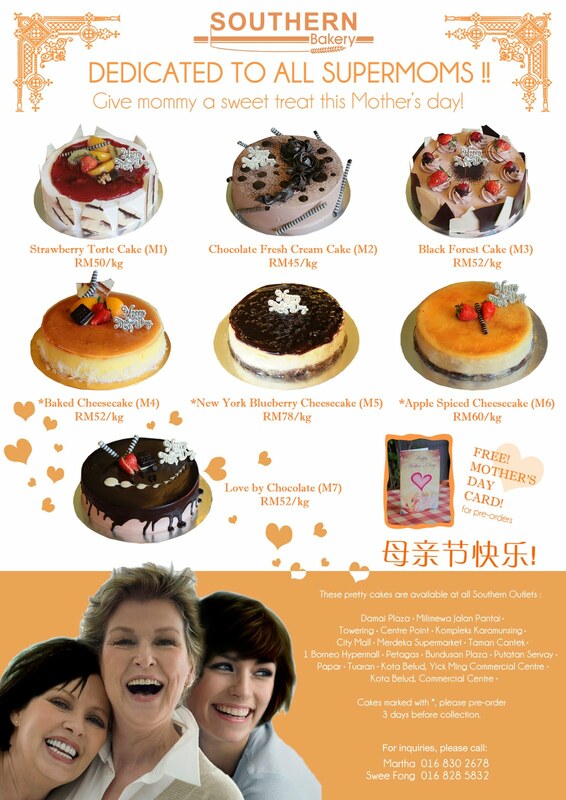 Bakeries in town are putting up posters and giving out leaflets to promote their respective Mother's Day Cakes Specials. They are all looks super delicious and mouth watering. But I still prefer home baked cake. On this mothering sunday, I will not able to bake a cake for my mum, as we will be busy moving house, everything are in a mess, I am sure she won't mind without a cake, she is not a cake lover, a dinner treat for her is definitely a must. You know i don't take my mom out to celebrate Mother day on that particularly day reason being,,,,it is just a hype,,, price is expensive, restaurants are mostly crowded,food quality tend to drop and noisy. Eugene, your are right! We normally do pot luck style meals most of the time, so can avoid those cut throat prices on Mother's Day.